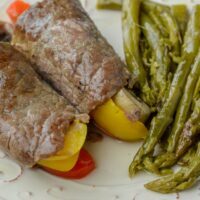 If you are on the keto diet, you might want to dive right into these Foodi Keto Steak Rolls and Asparagus. You can also make these steak rolls in your Instant Pot. 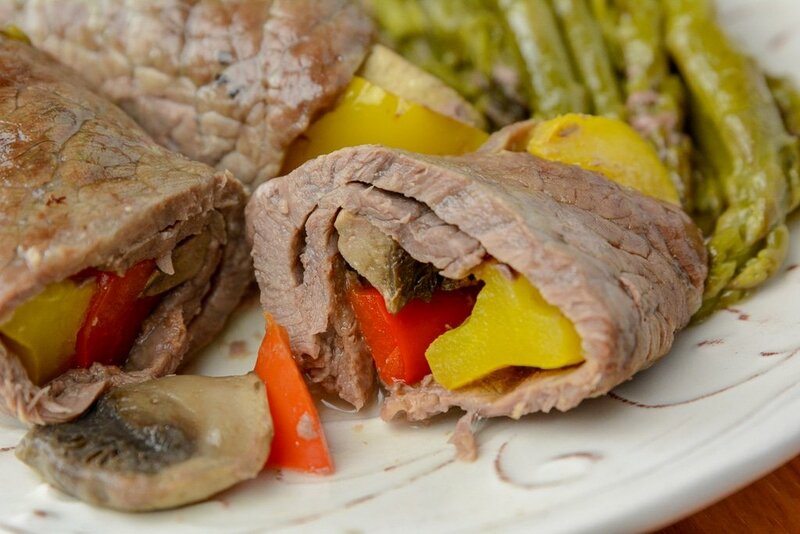 They are juicy steak strips that are rolled up, and filled with peppers and mushrooms and cooked to perfection. Pair with a side of asparagus and you have a low-carb keto-approved lunch or dinner. Steak is a staple in our home. I am always on the hunt for creating new and different ways to serve up one of our favorite meats. I picked up some thin steak at the grocery store along with some fresh veggies. Came home and created a masterpiece in my Ninja Foodi. The steak was seasoned perfectly and nice and tender, and with the veggies wrapped inside it seasoned the meat even more as it cooked up. 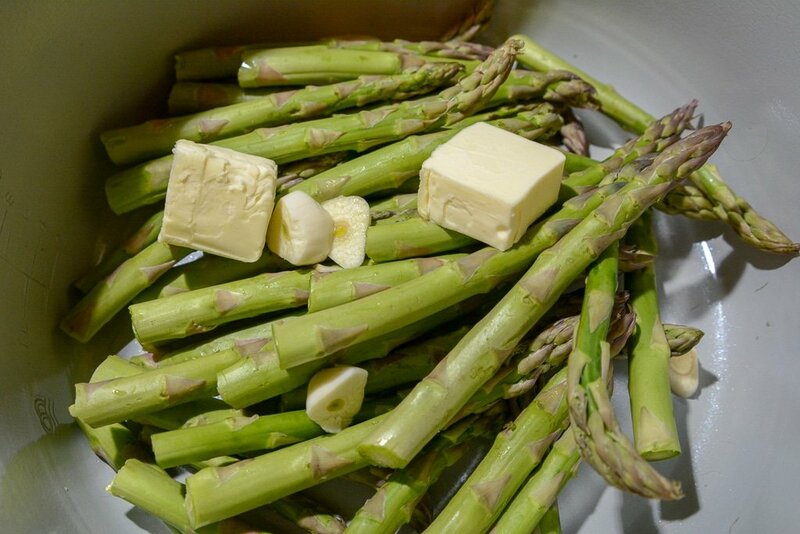 The asparagus was tender and such a nice and light side dish to pair next to it. Best of all this dinner was quick to whip up, and took hardly any time for me to do. Reach for a thinner style steak. Depending on where you live will depend on what the cuts of meat are called. I reached for a thin steak, you can use skirt steak, sirloin tip steak, or even flank steak. If you find the steak is a little thick, grab a tenderizer or rolling pin and beat the steak a little to break it down and make it thinner. 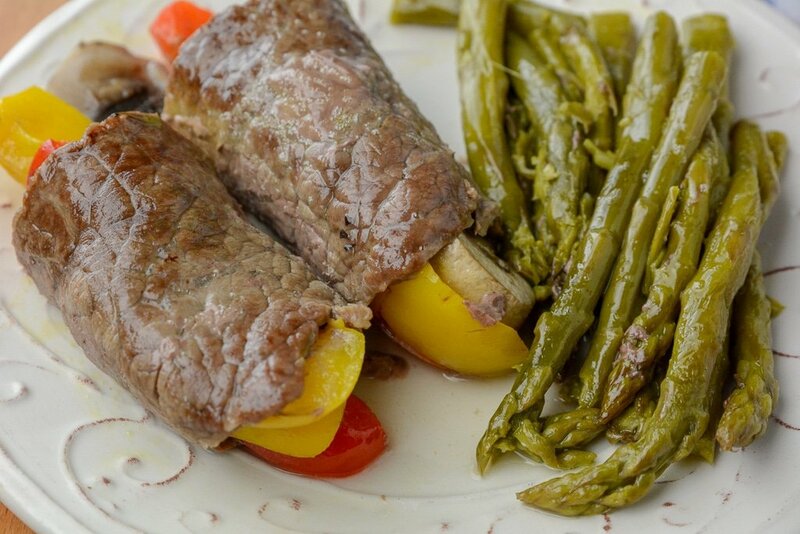 The beauty of these steak rolls is the versatility. You can use any veggies that you enjoy and like. From zucchini, peppers, carrots, mushrooms, or any other veggie you prefer. The more variety you use, the more brightly colored it will be! Secure your meat with a toothpick to keep the steak rolled up as it bakes. 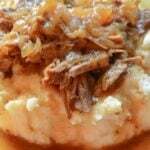 Then when you are done the cooking, remove toothpicks and serve. Yes, you could make steak rolls in the oven, but I find the texture of the steak tastes amazing using my Instant Pot or even Ninja Foodi. 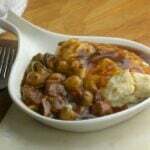 Plus you can cook your asparagus and steak rolls in the same pot for a super quick and easy cleanup meal. 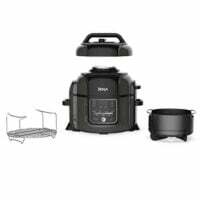 I use my Ninja Foodi or Instant Pot for almost all our meals. It is just so versatile and makes cooking dinner so much faster and the flavor is outstanding each and every time. 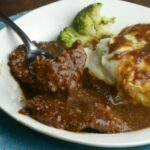 Not much prep is needed for these easy Instant Pot keto steak rolls. Give them a try and let me know what you think! 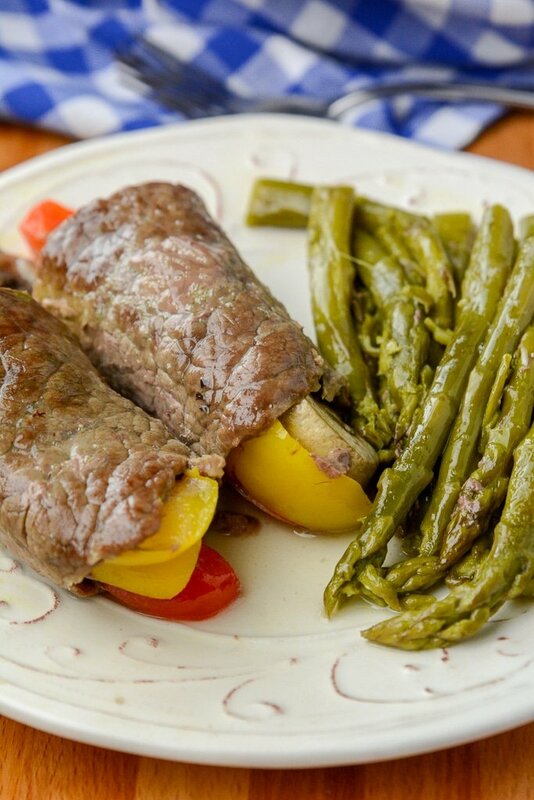 We are loving this healthy and easy steak roll recipe. New to Keto Diets? Check out The Ultimate Guide to a Ketogetnic Diet. Roll steak and secure with a toothpick if needed.